Instagram, undoubtedly, is one of the more popular social media apps. Since Instagram is leaning more on posting pictures and videos, the app may consume a considerable amount of data. This may not be an issue if you are connected to a Wi-Fi connection or you are on an unlimited data plan. However, for those on the pay-per-use data scheme, Instagram can take a large piece of the mobile data expense pie. 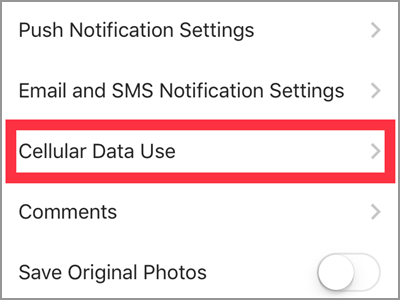 This article will help you set Instagram to use less data. To fully enjoy the Instagram mobile app you need to be connected to the internet. It can be through a Wireless connection or by using your network allowable data consumption. Since Instagram carries images and videos most of the time, it consumes a huge amount of data. Fortunately, you can set the Instagram app to use less data. Let us show you how it’s done. 1. Open the Instagram app on your Home screen. 2. On your Instagram Home page, tap the icon in the bottom right corner of your screen. It’s called the user icon where you can find your profile account details. 3. Tap the gear button found on the right side of Edit Profile tab. 4. Different profile settings are accessible on this page. Scroll down until you get to the Settings option. Tap the Cellular Data Use. 5. You will see the only option available for this settings. Tap the button on the right side of the menu Use Less Data. The button should turn blue which signifies that the feature is enabled. Q: What will be the disadvantage of using this method? A: As we all know, pictures and videos consume more space compare to files and documents. Thus, it follows the need of high amount of data to completely access them. Also, the Instagram app preload data as much as possible for faster playing videos and it may display those high data consuming stuff. Because of that, it might take time to load such feed when Use Less Data applies. The good thing is, you can still view them. Q: I want to totally remove my Instagram app from using my mobile data. Is there any other option? A: Taking advantage of the Use Less Data option on your Instagram app can be beneficial to you. You can access the app with lesser data it consumes. However, if this doesn’t suit you, you can turn off cellular data for Instagram. Go to Settings. Then tap the Cellular tab. Turn on the Cellular Data. Under the Cellular Data option comes the list of apps installed on your iPhone. Tap the button beside the Instagram app to turn it off from using your consumable data. Q: I tried this method, but I want to use my Instagram using solely a Wifi connection. How can I keep my iPhone from using my mobile data when I’m connected to a weak internet connection? A: If you want to use wifi alone, you should check your Cellular Data settings. Your issue lies on your iPhone Wifi setup. On the bottom part of your Cellular Data menu, you will see the Wifi Assist option. If it is turned on, it will automatically connect you to the internet. This is if your current connection seems not sustainable for your needs. Q: My Instagram app doesn’t have that Cellular Data Use setting. A: If you can’t find this setting, it means your app is already outdated. Make sure to use the latest version to access this setting. Update your Instagram application on your App Store. This setting is a good choice to cut your data expenses since there is no stopping Instagram from auto-playing videos, and preloading videios using your data allowance doesn’t sound good. Now you can enjoy browsing your newsfeed more without worrying about your data limits. You just learned how to set Instagram to use less data. If you have questions about any of the information above, let us know in the comments. How Do I Download Over a Cellular Connection on Spotify?